Max de Wardener is a London-based composer. Newer works include a percussion concerto for Colin Currie and Orchestre National Bordeaux Aquitaine, a multimedia suite for Joby Burgess’s Powerplant (released on Signum Classics) and two pieces for Oliver Coates’s debut album on the Prah label. He has written extensively for film and television recently scoring his second film for Pawel Pawlikovski, as well as Sarah Gavron’s feature documentary ‘Village at the End of the World’. He is currently working with the artist Rebecca Salter and Okeanos on a new work as well as writing piano music for release at the end of the year. Evis Sammoutis (b 1979) is Assistant Professor of Composition and Theory at European University Cyprus and the Artistic Director of the annual Pharos Arts Foundation International Contemporary Music Festival. His works have been commissioned by many organisations such as the Venice Biennale, performed in more than 35 countries and awarded several prizes such as the Royal Philharmonic Society Award. Recent premieres of his music were given by the New York Woodwind Quintet, the Arditti Quartet, Klangforum Wien, Ensemble Modern and Neue Vocalsolisten. Christopher Mayo is a Canadian composer currently based in Toronto. Mayo’s notable projects have included commissions for the London Symphony Orchestra, Carnegie Hall, English National Ballet, the MATA Festival, London Sinfonietta, Ensemble Contemporain de Montreal (ECM+) and Rambert Dance Company and performances by the BBC Symphony Orchestra, the BBC National Orchestra of Wales and the Nouvel Ensemble Moderne. Mayo was the 2012–13 Sound and Music ‘Embedded’ Composer in Residence with the Manchester Camerata for whom he composed three new works. Since being involved with the LSO Panufnik Scheme in 2009, Toby has discovered Drum ‘n’ Bass, and now divides his time between writing for the concert hall and DJs such as Chase & Status. In addition to his composition and production work, Toby is a lecturer in music for Somerville College, Oxford, where he heads up a research unit looking into the connections between academia and creativity. Elizabeth Winters’ music is regularly performed throughout the UK and several works have been broadcast on Radio 3. Elizabeth won a British Composer Award (2009, Making Music Category) for her orchestral piece The Serious Side of Madness. In 2008 she won the Liverpool Capital of Culture New Composer Competition. She has also been the recipient of a PRSF/Bliss Trust Bursary and was on the Sound and Music Composer Shortlist from 2006–09. Most recently, Elizabeth won first prize in the 2015 Orion Orchestra Composer Competition. Larry Goves works as a composer, lecturer (Royal Northern College of Music) and teacher (National Youth Orchestra of Great Britain). Recent and current composition projects include music for the Norwegian ensemble BIT20 and new pieces for his own ensemble The House of Bedlam. Raymond Yiu’s Symphony (2014–15) was commissioned for the BBC Proms 2015, premiered by Andrew Watts, Edward Gardner and the BBC Symphony Orchestra. His works have been performed by the BBC Singers, London Symphony Orchestra, Lang Lang, Long Yu, and Lukas Foss. He has been nominated for the BASCA British Composer Awards four times (including The London Citizen Exceedingly Injured  in the orchestral category in 2013) and won in the chamber category in 2010. Raymond holds a DMus in Composition from Guildhall School of Music & Drama. 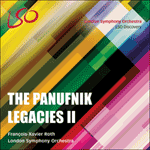 Being part of the Panufnik Composers Scheme in 2008 was the springboard for Raymond’s career in orchestral composition. Anjula Semmens is a contemporary classical composer from the UK. She studied composition with David Knotts, and later with John Traill and Martyn Harry at Oxford University. Her music has been performed by, among others, the London Symphony Orchestra, the Tempest Trio and Denise Felsecker, and has been described as 'striking … surprising and thought-provoking' (Ivan Hewitt, The Telegraph). Recently Anjula has been living overseas, working freelance and exploring the culture and music of Armenia, Italy and Germany. Edmund Finnis was born in Oxford in 1984. He has enjoyed close associations with both the London Sinfonietta—who have performed six of his works, including three that they commissioned (Veneer, Unfolds and Seeing is Flux)—and the London Contemporary Orchestra, with whom he is currently Composer-in-Association. Recent works include a string orchestra piece, Between Rain (LCO), a 30-minute electronic work called Point Blank Light, and a piece for cello with reverb, Across White Air, written for Oliver Coates. Forthcoming projects include new pieces for BCMG, BBC Scottish Symphony Orchestra, and a violin concerto for Benjamin Beilman and the LCO.